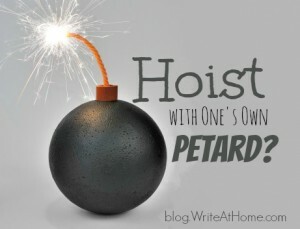 Home / Blog / What Does It Mean To Be “Hoist with One’s Own Petard”? A petard is a bomb used to blow blow up gates and doors, or to open breaches in walls. Petards were used as far back as the 1500s in attacks on fortifications. The usually contained gunpowder and were lit by slow fuses. We still use the word hoist — it means to lift or raise. We might hoist sails or flags. Construction cranes hoist beams and girders, etc. The past participle of hoist these days is hoisted. The form’s a little different in this expression because it comes from Shakespeare, but the meaning’s the same. So, for example, a congressman who goes to jail for breaking a law he voted for himself might be hoist by his own petard. So might an employee who protests a company policy so vigorously that it goes out of business — leaving him unemployed. One interesting, though somewhat disturbing, historical example of being hoist with one’s own petard is that of James Douglas, 4th Earl of Morton. In the 16th century, Morton designed and introduced to Scotland a type of guillotine that came to be known as the Scottish Maiden. It was put to use by Mary, Queen of Scots and was responsible for about 150 deaths, including, of course, James Douglas, Earl of Morton. Please add your comments in the Reply area below. Smart Balance Wheel http://www.fashionhoverboard.com solely outstanding to have that! A similar occurence occurred in Tintin and the Cigars of the Pharaoh, when Tintin was bringing a letter claiming that several friends had been driven insane and an enemy changed the letter so that it said that Tintin himself was insane. Also, one time I was playing Wizard 101 and when I was bringing news of failure to the Myth professor, he sent me with a letter to the headmaster. Unknown to me, the letter advised the headmaster to expel me. Fortunately for me, the headmaster did not follow that advice. Good examples of hoisting and near-hoisting, Will!